Coastal Islands & Atolls "Our Belize Vacation" - "Our Belize Vacation"
Why Consider Vacationing on Ambergris Caye? Ambergris Caye (pronounced am-BUR-gris or Am-BUR-grease Kay) is the largest of some 200 cayes that dot the coastline of Belize. Ambergris is part of a wide limestone peninsula dangling south from the Yucatan coast of the Mexican state of Quintana Roo. Ambergris is 25 miles long and a little over a mile wide, in some places, and it is located in the clear shallow waters of the Caribbean Sea just off the tip of Mexico's Yucatan Peninsula. The history of the island goes back to the days of the Maya, European Pirates and Mexican Refugees who fled during the Caste Wars. The descendants from Mexico make up most of the island's population today. The economy of the island was once dependent on the coconut industry, followed by the fishing industry, but it is now dependent on tourism. Most Ambergris residents are of Mexican ancestry and speak Spanish among themselves. Early in Belize's history, its northern neighbor even laid claim to the island. Ambergris Caye has about the same land area as the Caribbean island of Barbados, although much of Ambergris is uninhabitable mangrove swamp. Her coastline is protected by the 190 mile long Barrier Reef, the second largest living coral reef in the world (with the first being off the coast of Australia). In Mayan times, Ambergris Caye was a trading post. The Marco Gonzales ruins at the southern tip of Ambergris Caye and the Basil Jones site to the north, as well as the many recently excavated "home sites" in the heart of San Pedro Town give evidence to a former Mayan population of 10,000. The narrow channel that separates Mexico and Belize was dug by the Maya to provide a trade route from the bay of Chetumal to the Caribbean. The island's name is a holdover from colonial days and refers to a waxy substance found in sperm whale intestines that was once used in making perfume. Some say that ambergris washed up here regularly during the colony's early history, but marine biologists are skeptical. They maintain that whales have never been common in this part of the Caribbean and argue that sighting of ambergris have always been very rare. Following the Maya came the whalers and buccaneers and the ancestors of present day residents who were fisherman and workers in the coconut plantations. Today tourism has replaced fishing as the major source of income for the islanders although the mahogany skiffs are still in service for charter fishing and diving. Fishing was once the Caye's principal industry, but within the last 20 years tourism has taken over. Many fishers now use their boats exclusively to cater to visitors needs; snorkeling, sports fishing, diving, and manatee watching. San Pedro, the island's only town, offers a wide choice of hotels, restaurants, bars, gift shops, outfitters, and travel agencies to suit every recreational interest and pocketbook, although food and services are relatively expensive here. The island's biggest tourist attraction is the Belize Barrier Reef that runs parallel along the entire coast of Belize. The reef is only a quarter mile from the beach of Ambergris Caye making diving accessible. The island's seaside is jammed with jetties and dive shops which offer trips to the different dive sites and to the Great Blue Hole. There are also certified scuba lessons in NAU, PADI, and SSI. One of the most popular dive sites is the Hol Chan Marine Reserve, which is only a ten-minute boat ride from town. The reef's beauty and richness has put Belize among the top ten dive destinations in the world. Ambergris Caye is a food lovers paradise. Local cuisine is abundant featuring the Belizean favorite of rice and beans, stewed chicken and potato salad. Local foods are influenced by the Spanish and Mexicans with dishes such as Chimole, Escabeche, Panades, Salbutes, Garnaches, Tacos, Bollos, Tamalitos, Tamales and Burritos. Of course seafood is a common delight, with feasts of succulent lobster, conch and a delicious array of fish, squid, muscles, scallops and even shark. Most restaurants specialize in seafood dishes. However, lobster and conch are seasonal so be sure to check what is in season before ordering. Added to this array are the exquisite taste of seasonal tropical fruits such as pineapples, bananas, star fruit, cantaloupe, soursap, watermelons, oranges, grapefruits, tangerines, may plums, figs, blackberry, mangoes, craboo, and much more. Or, if you 're in the mood for something different, there are several restaurants that feature European, Cajun, Indian, Chinese, and Jamacian cuisine. 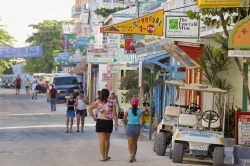 Ambergris Caye has many small settlements on the north and south of the main town, San Pedro. People who acquire land on Ambergris Caye and make it their home tend to give names to their pieces of paradise and as more people move into the area, the names are often adapted by all. Each area has its unique features that both visitors and locals have come to love and enjoy. Why Consider Vacationing on Caye Caulker? Caye Caulker is the second most visited island, off the coast of Belize. Here you will find a backpackers Haven. Accommodations are usually cheaper than compared to Ambergris Caye, life is a tad more laid back, yet you still have the same great fishing, snorkeling, and adventures available to you, as offered on Ambergris Caye. For this reason, Caye Caulker is the island most often chosen for those looking to vacation on a budget. Caye Caulker snorkeling is world class! From your first glimpse underwater, you are in a totally different world - brightly colored fish, sponges, corals, and other creatures everywhere! We offer it all and at very competitive prices. Thousands snorkel our reef and surrounding areas every year and all have wonderful comments when they leave. Caye Caulker tour guides will help you enjoy snorkeling to the utmost. If this is your first experience, they will assist you with the mask and snorkel. Our guides are trained to protect the corals, which are delicate, vulnerable living organisms. Please follow their instructions and do not touch, stand or walk on the coral. Be careful of your fins so you do not kick the coral or stir up too much sand. Caye Caulker Marine Reserve - Right off Caye Caulker you can snorkel in the world's second longest barrier reef. In the Coral Garden you can see some many fish and beautiful colorful corals. Swim with nurse sharks and eagle rays. It's a once in a lifetime experience! Bottle-nosed dolphins often swim around the boats in route to the reef. Bottle-nosed Dolphins - photo by Ramon Reyes Hol Chan Marine Reserve - Explore beautiful Hol Chan! Already a Marine Reserve for 12 years, the fish have had time to grow very large, especially the groupers. See marine life in its natural habitat, such as, barracudas, red snappers, and even see octopi. Snorkel with sharks and rays in the Shark-Ray Alley, another beautiful reserve. See how friendly these animals can be. A lunch stop at San Pedro gives you a look at another of Belize's island communities. BELIZE ISLANDS - Why consider vacationing on an island? For those looking for the true get away, try renting an entire island for a week. Most island rentals come with your very own chef, fresh meals prepared daily, and the chef often is your snorkeling and diving guide when he's not cooking. Most island lodges or resorts, offer the use of snorkeling gear, kayaks, and have areas designated for swimming. The snorkeling and diving is some of the best in the entire world, as you explore the second largest barrier reef. Many of these islands are scattered along the Belize Barrier Reef or admist the various Atolls, off the mainland coast of Belize. Though accommodations can be a bit rustic, most lodges or resorts do have electricity and captured rainwater for bathing and cleaning. An island rental or retreat, makes a great place to have a family reunion or a private wedding party. Belize's famous Barrier Reef, less than a mile off-shore from both Caye Caulker and Ambergris Caye, is marked by this famous "cut", or break, in the reef, where the mixing water from the open ocean (and bait thrown in from tour boats) ensures plenty of wildlife. This UNESCO WOrld Heritage Site occupies the northern tip of Ambergris Cyae and boasts amazing snorkeling and diving; the area is rich with history and lore. One of many ocean-bound excurions available from Belize's Northern Cayes. This protected area offers visitors manatees and shorebirds. The steep drop-off and clashing currents at Turneffe Island's southern tip make for a unique dive site because of the dee-water fish that frequent the area, as well as a thriving population of interesting sponges. The beautiful crescent-shaped island is at the southeast corner of Lighthouse Reef Atoll. The wall just off-shore is one of Belize's more fascinating sites, with numerous tunnels and canyons in the reef crest, all swimming with wildlife. Saint Peter Town - the only town on the island of Ambergris Caye is about one and a half miles long and in some places about a mile wide. Its atmosphere is that of a small bustling fishing village, and is home to the majority of the island's population as well as a majority of the restaurants, bars, clubs and hotels on the island. Visitors will most likely find what they need within walking distance. The town is clustered with wooden houses, some with Mexican decor, other Caribbean, and some still remain with the English colonial architecture. Gift shops, boutiques, bars, cafes, and restaurants adorn Front and Middle streets (now named Barrier Reef & Pescador Drive). A short walk in town and you'll feel the friendliness of the people and witness the ease of their lifestyles as they go through daily life. Bare feet, tee-shirts, and shorts is the typical island dress code. The people of the island are call "Sanpedranos" and speak English, Spanish, Creole, and Maya all at the same time, making it their own island dialect. They are proud of their heritage and are willing to share it with tourists. Before tourism picked up in the eighties, the islanders were mostly Mestizos (Maya-Spanish). Today they share their island with the Creole, Maya, Central American refugees, and Americans that have made San Pedro their new home. The vast majority of San Pedro's residents are good humored and tolerant, their lifestyle casual and simple. The tin-roofed, colorfully, painted wooden houses are cheerfully dilapidated, giving the distinct impression that you can relax all day if that's is your choice. The evenings on the island are a social event. You will find tourists and islanders at different bars and restaurants listening to reggae and Latin music and sharing the day's adventures. For those that like a take to take a day off from driving, day tours can be arranged to the Maya archeological sites and Belize's lush rain forest. For those who just want to relax, a day on the sandy beach, may be all that is needed. While San Pedro is suffering under the strain of rapid growth, Ambergris Caye still has much to offer. People are friendly, accommodations are comfortable, and there's plenty to do. Resorts on the outskirts of San Pedro are noticeably more expensive, but tend to be more tranquil and luxurious than hotels in town. Hikers and bicyclists will find that much of the island is covered with a high broadleaf forest interspersed with freshwater sinks that attract lots of wildlife, including an abundance of birds. Birders can spot warblers, egrets, herons, pelicans and frigate birds. Bird Cayes, located on the bay (leeward) side of Ambergris, shelters rookeries for 30 species, including the reddish egret, greater egret, and cormorant. Spoonbills, avocets, and ducks also congregate here. Turtles nest on certain yet undeveloped beaches, and even large cats prowl through the mangroves. Thousands of shells litter the beaches, with the coral reef being less than a mile offshore. Ambergris Caye island has the largest single concentration of tourist services, with San Pedro still being able to retain a laid-back atmosphere. Most of the island has sandy streets, that belong to slow moving golf carts and baby strollers. The water off the island is iridescent blue and immediately accessible to the residents and guests. A cooling trade wind sweeps in front the northeast much of the time, keeping insect pests at bay. A variety of food and drink is available, and some of the country's best cooks are happy to prepare fresh seafood exactly the way you like it. North of San Pedro is San Juan (or St. John), a community located directly north of the center of San Pedro Town. The area is home to majority of the work force of San Pedro and has its own unique mixture of people from all over Belize, Central America, North American and even Europe. The Zaak Ba Ajo Lagood is a great spot to snorkel, boasting unique aquatic life and the lagoon's own little blue hole. Boca Del Rio or Mouth of the River, is a settlement in the north of the island located directly after San Juan and just before the river. A bridge wide enough to accommodate people, bicycles and golf carts like Boca Del Rio Area to other areas in the far north of the island. Visitors to Boca Del Rio can enjoy swimming where this salt water river meets the sea as well spending time at the Boca Del Rio Park. The water slides in the park are especially fun for small children. South of San Pedro is San Pablo (or Saint Paul), a small community located just over a mile and a half southwest of the center of San Pedro Town and facing the lagoon. Visitors often take bicycles or golf cart rides up Avenida Del Sol which stretches to the Lagoons edge - in San Pablo to watch to sparkling sunsets over the glossy surface of the lagoon. Mar De Tumbo or the Tumbling Sea is the only spot on the island where the waves tumble to the shore through a break in the reef instead of first breaking on the reef life the rest of the island. This is a popular swimming area located just over a mile south of San Pedro. Other communities include the Escalente Sub-division in the south, San Miguel near San Pablo, San Telmo in the south near Mar De Tumbo, Sunset Coves in the south, San Pedrito located along the San Pedro Lagoon, Tres Cocos in the north, Las Palmas, and the Basil Jones area both also located in the north.